Bring some old-world Parisian charm to your dining experience with this novel single wine bottle and 6 glass display! If you're having friends or family over for dinner this tabletop wine rack is the perfect choice. The artistic wine bottle rack also features 6 slots for keeping your wine glasses close at hand. This makes the eye catching wine holder a great choice for small gatherings of friends and family. For larger gatherings, just go ahead and put this wine serving rack on every table! 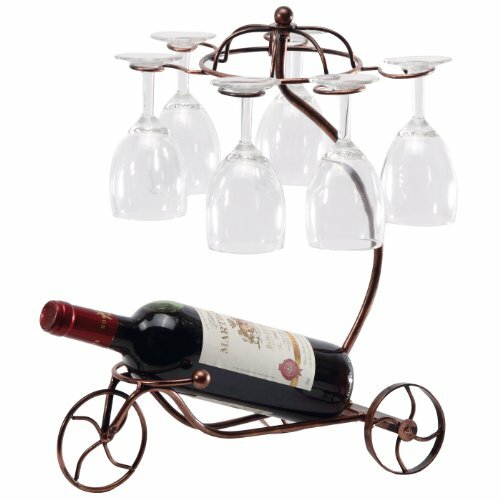 The vintage bike design of the novelty wine holder has a very laid back style that is sure to add a fun and festive touch to any party. Whether you are dining in with friends and family, or just having a few glasses of wine, this wine glass holder is a perfect choice! The wine bottle holder can also make for a thoughtful housewarming, birthday, Christmas, or wedding gift. Approximate dimensions (in inches):13.75 L x 10.5 W x 15.5 H.